What an easy scrap quilt to make! It is hard to throw away all those small pieces leftover from other projects, so have this quilt in mind as you are cutting other quilts. Cut the extras into strips from 1� to 2� wide. Place them into a plastic container. When you have a �bunch� of them saved, start piecing. Sewing even in short spurts will get this quilt top done in no time. You could even cut many strips from your fabric stash and trade with other quilters, so you can have a great variety. The larger variety of fabrics the more �scrappy� your quilt will be. For a different look, pick one or two color families for the herringbone and a contrast for the plain strips. Or pick a favorite batik or other large print for the plain strips and follow that color scheme throughout the making of your herringbone strips. Herringbone sections: Strips of fabric of varying widths (1� � 2� wide) cut into 6� long strips. You will need the equivalent of 2 to 2 � yards of fabric. Nine or ten fat quarters will make this quilt, but using at least twice that many different fat quarters will make a much more interesting quilt. My supply of scraps from borders and binding was building up past critical mass once again, and I knew that I had to do something quickly. I decided to make some herringbones, which almost of their own volition, grew into a herringbone quilt that practically made itself. I pulled out all the strips and pieces of bindings and borders that I had saved from quilts and other projects from the past year. I cut them into 6� lengths, regardless of their individual widths, although I did set an arbitrary maximum width of four inches. A strip that wide got cut in half, widthwise, before cutting it into six inch lengths. When I had about a bazillion 6� lengths cut, I dumped them in a bag and began to make herringbones. (This is the bubblegum for the brain kind of piecing that is wonderful to do when you are half watching half listening to a classic movie on TV.) I pulled out two lengths at random and sewed them together at a right angle on one end. I finger-pressed the seam, pulled out another strip (again at random), lined it up adjacent to both pieces of fabric in the first pair and sewed it to them. I kept on adding strips in this manner, first one side, and then the other. You will notice that I did not worry about the difference in the widths of each piece, just kept adding them on, and my herringbone grew and grew. After I had about eighteen to twenty pieces on either side of the herringbone (40 pieces in all for each strip section), it measured 30 plus inches so I stopped and started another one in the same manner. I was having such a wonderful time, playing with all my strips that I kept going, making five strips in all, each very different from its cousins. Now came the big decision, what was I going to do with them all? I had originally planned just to make long, long herringbones and use them as borders on some future quilt, but I felt that they were so colorful and unique they needed a quilt of their own. However, they were simply too busy and bright to sew together horizontally to make a quilt top, even for me, a color fiend. Away to my stash where I unearthed some serene fabric with a warm, beige background and calming, tiny polka dots of white scattered across it. Perfect! I cut four 4� by 30� strips. Next, I measured the width of each of the herringbone strips and trimmed them all to 6�, which was the width of the narrowest strip. Then I sewed them, alternating directions, one up and the next one down, between the four strips of beige fabric. Ta Dah! 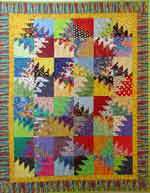 The quilt top was finished and I�d just used up some of my scraps. Hooray! I backed my quilt, now called Life Has its Ups and Downs and quilted it by machine stitching in the ditch down the seams between the herringbone strips and around the borders. Then I hand quilted zigzags across the entire quilt, following those that were formed by the herringbones. 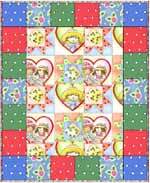 The quilt is approximately 44� square and perfect for someone small to curl up under.